miles of woods and fields from nearby towns. Note ancient castle on wooded hilltop and nearby croplands. In Europe you may visit one charming village that is famed for its local cheese and wool, and then travel through a lovely rural landscape to another village noted for a winery and an ancient monastery. Europe seems so special and quaint to American visitors. Western Europe is a densely populated part of the industrialized world. What is so clever about European village life that has allowed it to survive intact for a thousand years? It is so obvious, you can see it from the air, yet planners here have hardly put it to practice. 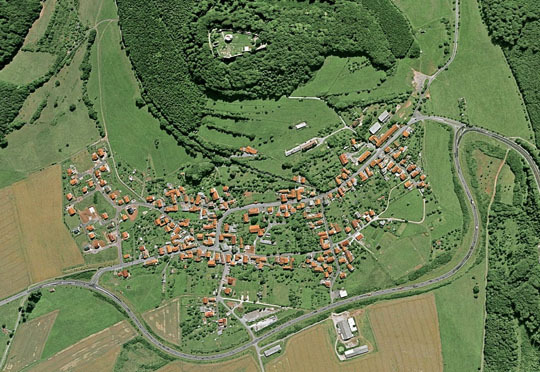 When flying over Ireland, France, Germany or Italy, you can see that each village is separated from the next by woodlands or farmland. Each town is a distinct community. Separated. Each has its own identity and history. This is not possible without a respect for the past and respect for the place. The Hawaiians had both - Americans have neither. Most Americans live in the middle of suburban sprawl. Such locations have no history or sense of place - other than what their developers named them - "Woodcrest", "Buena Vista", or "Bali Hai". Until recently those locales were prairie, desert or canefield, but now they are part of the dominant Car-Culture, and operated with the assumption that Everywhere-is-Nowhere. On the mainland we see a new phenomena growing at the perimeter of the residential sprawl - they are called "Edge Cities". People don't live there. Edge Cities are commercial-industrial developments out at the interstate intersections where people go to work and play. Edge Cities are where the Progressive Insurance Regional Center shares an exit ramp with the Galleria Mall. Where the Manpower Office shares the parking lot with Thank God It's Fridays. This relation of home, office, and play is the old city-and-suburb model turned inside-out. Here on Kauai; in Kapaa-Wailua, Hanamaulu-Puhi, and Koloa-Poipu, we are beginning to see this phenomenon. As our county government continues to promote development between our communities, that which makes our towns distinct and meaningful will disappear. What will also disappear is what makes Kauai meaningful. In the last column, Jonathan Jay and I proposed establishing districts that would follow traditional Hawaiian ones, but be new political entities. In that plan seven districts would select representatives as County Council members. Our motivation was to establish a new island politics that would better represent the interest of the environment (aina) and the people (kama'aina). We are continuing to refine this idea and hope to get this issue on the next election ballot. Contact us if you are interested in joining this effort - email jonathan@dakauai.com. I am pursuing another simultaneous effort to enhance an aina/kama'aina powerbase. This would be establishing townships. In order to keep Kauai "quaint", we could limit development to within the boundaries of existing established communities, with each local planning it's own internal "growth", or lack thereof. A parallel objective would be to enhance the greenbelts of woods and agriculture that separate towns. The Hawaii Constitution allows for self-organizing government below the county level. This would include incorporated townships. Incidentally, Connecticut, as a small state, decided to have no County governments at all. Just the State and the Townships. Here government by island makes sense, but that could include townships too. As a preliminary example, I have made a list of 16 communities that might be considered potential townships. They include Kekaha, Waimea, Hanapepe, Kalaheo, Koloa, Poipu, Puhi, Nawiliwili, Hanamaulu, Wailua Houselots, Wailua Homesteads, KawaiHau, Kapaa, Anahola, Kilauea, and Hanalei. They had to be big enough and separate enough to qualify. Many Kauai towns have several, but not all of these features. That should be corrected, but the trend is going the wrong way. For example, the Lingle supported DOE policy is to consolidate into fewer, bigger, more uniform schools. As a result, more kids, before high-school, must be bussed or driven out of their communities to be educated. Here on Kauai, grades below the 6th have been eliminated from Waimea Canyon Elementary to make it the regional Middle School. This while Eleele School no longer handles the 6th grade, in order for it to be a "standard" Elementary. As a result, children in both communities must be bussed to the other to complete school through the 6th grade. It's kind of like a Mad Hatter's Tea Party. With township based planning each community would offer education through middle school. This would mean all kids, until they started high-school, could bike to their school, the library, the neighborhood recreation center and give mom's poor Caravan some well earned down time.